Minister RD, Panchayat, Health & Family Welfare Alo Libang appeal the teachers of Ekal Vidyalaya to create human resources for development of Nation. Minister RD, Panchayat, Health & Family Welfare Alo Libang appeal the teachers of Ekal Vidyalaya to create human resources for nation development of state and country. Libang was addressing the valedictory function of 5 days training programme of teachers and resources person of Ekal Vidyalaya under theme ‘ Ekal Abhiyan’ here at Nyokum Namlo today. He said that teachers are treated as nation builders and their act should be of like of a father, parents and guardian and should able to create human resources with the young generation who are future of tomorrow. The future of the state and nation lies with the hands of youth and we should mould the youth with a good guidance and lots of knowledge and skill who can change the destiny of our state and country future. 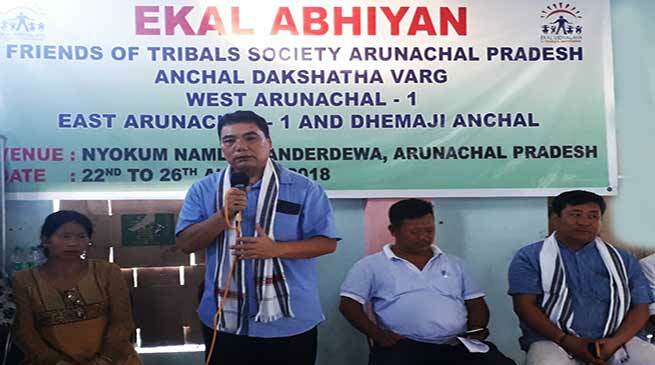 He while lauding the service of the organisation ‘ Friends of Tribal society of Arunachal Pradesh (FTSAP) unit of Kolkatta chapter who are involved in the imparting education in 240 schools spread across the state to dedicate their time and skill for creating human resource for the development of our state and nation. He also appeal them to teach the students with a good moral value so that upcoming younger generation help the parents and able to respect and regard their parents and seniors with a responsibility. Ekal Vidyalaya is a movement involved in integrated & holistic development of rural & tribal India. The main activity undertaken in this movement is to run one-teacher schools (known as Ekal Vidyalayas) all over India, in the remotest rural & tribal villages to take the education to every child. The overriding philosophy of Ekal Vidyalaya Movement is to take a holistic approach of social and economic development to Tribal & Rural India that is Bharat. With the participation of numerous trusts and non-profit organizations, this movement has become the largest grassroots level non-governmental education & development movement that operates in the remote villages of India. The Ekal Movement aims to help eradicate illiteracy from rural and tribal India following the philosophy of rural development based on the criteria of equality & inclusiveness across all the sections of the society. Executive Member Er, Tadar Gagung, over all Incharge Hillang Tajok among other also address the gathering. Local leader Kipa Hipik, former IMC Councillor Kipa Tarish among others area heads of the organisation of East and West Arunachal and Dhemaji area of Assam were present on the occasion.